It’s one of those numbers that I’ve got in the back of my head for no reason: 2.75 seconds. That’s how long it takes a car dropped out of a plane to accelerate to 60 miles per hour. When I saw the hilarious new Tesla Model S P100D did 0-60 mph in 2.5 seconds it was a reminder that Elon’s electric sedan was now faster than gravity. There are a lot of caveats but let’s get into the simple math. Everyone knows that an object in a vacuum accelerates at 32 feet per second squared (ft/s2). What many people may not know is that 60 mph = 88 ft/s. Thus, an object gets to about 47 mph in two seconds and by the time it gets to 60 mph it’s been approximately 2.75 seconds (88/32 = 2.75). Of course, 60 mph is a somewhat arbitrary measure created to test cars and it comes from a time when 60 mph was much harder for a car to achieve. Now these numbers are suspect because that’s what automakers are aiming at with their launch modes. We should really be talking about 0-to-100 mph times, but I’ll never get my way with that. Where it gets more complicated is when you add in wind resistance and other factors. 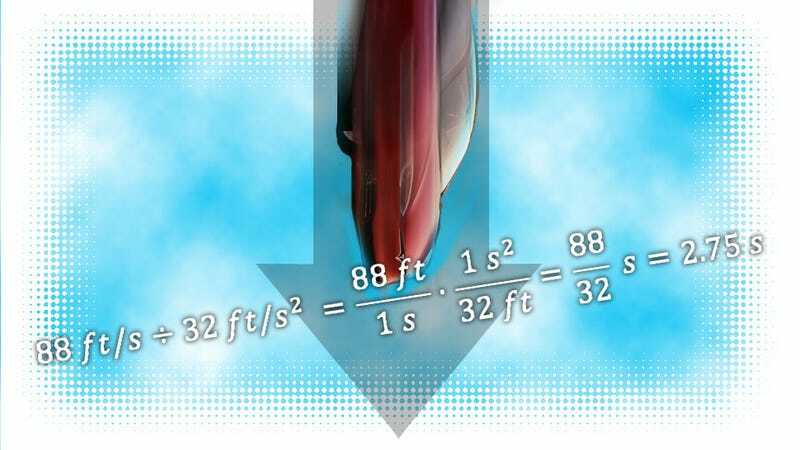 As we learned in the Mythbusters episode below (where they sped the car up to its top speed), a car will tend to stay nose down so wind resistance on an aerodynamic car means that it probably has a pretty high terminal velocity. Because the Model S P100D is electronically limited at 155 mph that means that you could drop one from about 3400 feet and it would hit the ground roughly at the same time as an identical car on the ground would travel the same distance. So a Tesla Model S P100D is faster than a car dropped from more than half a mile in the air. But what’s the fun in that? Using this calculator you can try and figure out what the terminal velocity of a Tesla Model S really is. We know cars tend to point down when they’re dropped (although those are usually front-engined cars and the Tesla has a good weight balance) so we’re using this work from Car And Driver to determine the slipperiness of a Tesla and hoping it will apply even though the new Tesla seems a little sleeker. Assuming the typical density of air at ground level, a coefficient of drag of 0.24, a mass of around 5100 pounds (it has more batteries), and a frontal surface area of 25.2 square feet you get a terminal velocity of 520 mph, which seems high to me, but there’s the math. If you assume that the car, which has a nice weight balance and a low center of gravity, would fall with its wheels pointing down towards the earth, it reaches a much lower terminal velocity closer to 110 mph. There’s no way that a Model S even totally uncorked is going to get anywhere near its terminal velocity so at some point gravity will win, but it’s fun to think that a vehicle is capable of hitting this faster-than-gravity measure, which I shall call the “Hardigree Line” because I’m vain. Notable here is that the Tesla Model S is a sedan and the other cars are high performance exotics or near-exotics. Also worth noting is that a Model S is going to run out of juice pretty quickly if you keep testing this. I do think we should test this, though, and I call on Elon Musk to offer us two Tesla Model S P100Ds, a helicopter, and a wide open space in order to do so. With the autopilot system in a Tesla we don’t have to worry about anyone getting harmed. Special thanks to mathematician Galen McQuillen for his assistance.